Tattoo Blog » The Don. Tattoo Blog » Ads » The Don. 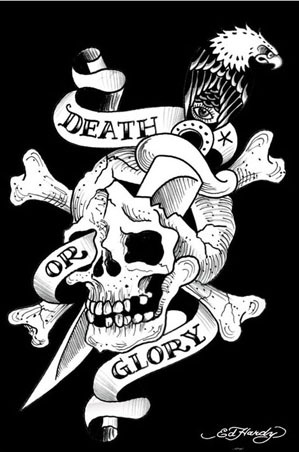 There are very few people in the tattoo world like Ed Hardy. By that I mean that depending on who you’re talking to, the mere mention of the name Ed Hardy can invoke everything from respect to outright disdain. Any tattooist worth their salt knows that there can be no debating on the legendary status of Hardy’s tattoo reputation. At 65 years of age, he was in the game long before the vast majority of today’s tattoo artists. He is something of a Don, which – no pun intended (okay, maybe a little bit of pun intended) – also happens to be his first name. Don Ed Hardy is certainly to be respected as a tattoo pioneer and an artist who helped to transform tattooing toward what it currently is. And that’s where the other camp, the one that sees Ed Hardy as nothing more than tacky sportswear and trendy garbage typically worn by aggressive mouth-breathers and their tacky entourages, pipe in with their two cents. You see, for most people, Ed Hardy is not a name that is typically associated with respect and admiration as any sort of legend in his field. For most people, the tattoo history linked to Don Ed Hardy is as foreign a concept to them as is the concept of becoming a Whirling Dervish. The truth of the matter is that Ed Hardy actually doesn’t have a whole lot to do with the clothing that everyone seemingly loves to hate. The thanks for that should all be attributed to French designer Christian Audigier, the same dude who made Ashton Kutcher’s life worth living several years back with the Von Dutch trucker hat trend. In fact all that Ed Hardy actually has to do with his clothing line is the licensing of his designs to Audigier. After that, Hardy just rakes in the cash. No more, no less. Perhaps more people will learn about Don Ed Hardy with the release of the documentary Ed Hardy Tattoo the World, which recently had its world premiere at the Honolulu International Film Festival. The next screenings for it will be in October and you can check out a full listing here. At any rate, the documentary examines the early years and life of this fascinating figure, a figure who if there were such a thing, would absolutely have his place secured in the Tattoo Hall of Fame.